The beauty of LEDs comes in that they use low amounts of electricity. No hidden charges and you don’t get to worry about it heating up when it’s too close to the plant. We call them the greener way of discharging clean light since they don’t use toxic metal halides which in many cases contain mercury. Here are our top 10 Best LED Grow Light. Another significant advantage of LEDs is that they are easy to set up. They deliver light directly to the plant so; you’ll not need several devices. They do not only save you on heating cost but on the space, you’ll need for correct lighting. You can forego the extra ventilation and air conditioning as they are also equipped with internal fans to cool themselves. As with any new tech developments, you can expect that the price ranges for LED grow lights to be significantly wide. That’s where the challenge begins. But if you don’t know exactly what to look for you can be in a deeper quest. What Are Some Of The Advantages You Get From A LED Grow Light? The Best LED Grow Light has a long life span- Most LEDs have a rated lifespan of over 10years. That is between 50,000-100,000 hours. Efficient- you can put LEDs closer to the top of the plant because they run cool. It also means that your crops will have low transpiration rates and therefore use less water in the long term. Skip Ballast- LED grow lights do not require a ballast as a measure to prevent them from self-destruction. Thus you’ll have no extra charges on electricity bills. 1. Is The Light Output Manageable? Every LED is distinct to the colors it produces. You should be able to manage the light output to the phase of growth for your plant. Say your plant is in the flowering stage, you’ll want the LED to produce the light that suits that season. 2. What Is Growing In Your Space? Some LED grow lights are designed to go the full cycle while others cover specific grows. 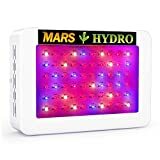 If you are growing cannabis, for example, there’s an LED light for it, some of which we’ll discuss here. If you are into flower gardens, horticulture, or research, there are LED grow lights to cover every area. Your grow space should be in line with the wattage from the LEDs. This is the only way you’ll know your crops are having it right. The numbers on your LED grow light has a story to tell. Here, we urge you to look at the spectrum. It is measured in terms of a number between 400-700nm. It shows the light delivery to your plant which will, in turn, promote the growth you want to see in the crop. A high number means not much is getting lost in heat; hence there’s a good light distribution pattern to promote growth. If you are just starting out, it’d be wise to pick up a few of the items below. Grow Tent-Constructing a grow room is out of the picture for many of us, that’s why we highly suggest going with a grow tent. It is easy to assemble, lightweight and makes a better control space for odors. It is also affordable, and you can put it anywhere with enough space. Airflow System– Your indoor garden will require fresh air to thrive. You’ll also want to prevent stunted growth. With the correct airflow, you’ll have strong growth which yields high harvests. Invest in a good air purifier like Ozonators and air dispensers. An air filter also does the trick to keep away mold and mildew from forming on the lights. Thermo/hygrometer– You’ll want to measure all the factors that affect growth in your grow tent. This way, you can control the humidity and temperature for both day and night. PH and PPM Meter– Know the best levels of PH and Light that your plants need so that you can manage these levels. Invest in proper PH and PPM meters to ensure you have the right nutrients for your crops. 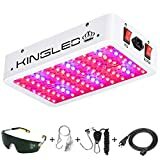 Grow Room Sunglasses– Did you know that the LEDs you use for your grow room simulate the sun? Well, every design warns against staring into the light directly, and it should come as no surprise since we know the looming danger of long period exposure. Pest and Disease Control Products– Indoor plants also attract a following of pests. It is only natural that you have a means of controlling them by purchasing products in that regard. Look for products which kill plant predators and insect pests. Do not forget to spray your crops to prevent diseases. 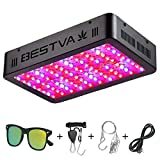 The BESTVA Double Chips are the coolest entry in the LED grow lights category. It boasts a full spectral output 380nm-780nm. It has the best variety of colors from infrared, UV, orange, blue, warm white and even red. 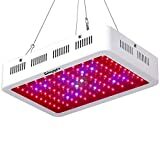 From the ratios it has, it makes for a full cycle LED grow light which covers your crops during flowering. The PAR rating boosts photosynthesis to great lengths which account for faster growth. The powerful 10W LEDs have a high light intensity which is efficient in covering a large area without the need for many extras. Its best attraction is that it runs cooler than any HID light you’ll encounter. It is furnished with a heavily built fan system to ensure that it operates at a 500F-600F cooler. You are safe from hefty lighting bills as this is not an investment you want to pile bills over. Managing the light spectrum for the coverage is much easier using a timer. With a core coverage at 5.1ft x 4.7ft when suspended at 24-inches you’ll be able to manage the growth through different phases. What’s more, it has a timer mechanism to adjust the light spectrums. You don’t need to spend extra on ballast as it can go without. Not to mention; the aluminum construction of the panel is synonymous with providing long life. This is since it sees to it that heat convention is maintained. With that, you should expect around 100,000 hours of life from this panel. 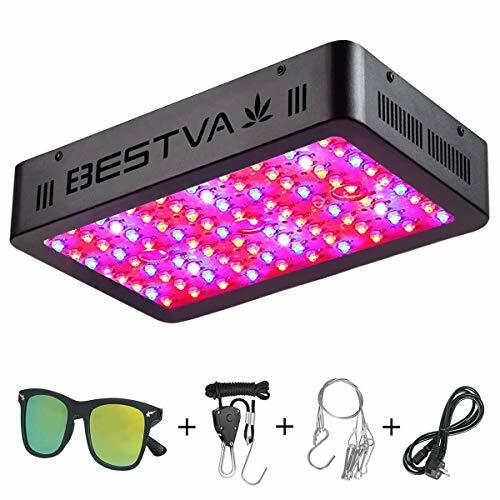 And, this best LED grow light does not require that you dig too deep into your pocket. You’ll be happy with the investment and more so for the future savings. The KINGBO is an innovative design of LED grow lights which achieve maximum light output for your plants while managing the energy consumption. It is more efficient than using HID grow lights in that it comes with a six-band spectrum of 380-740nm. With it, you can switch up the colors from white, blue, UV, IR, or red to cover all stages of growth. It equals the natural sunshine only that you can control it to get the ideal height for your crops which will give you massive growth. This panel consists of 225pieces of LEDs of 0.2w which produce super bright light in long wavelengths. You get to control the light out of the panel since you can easily schedule by time. 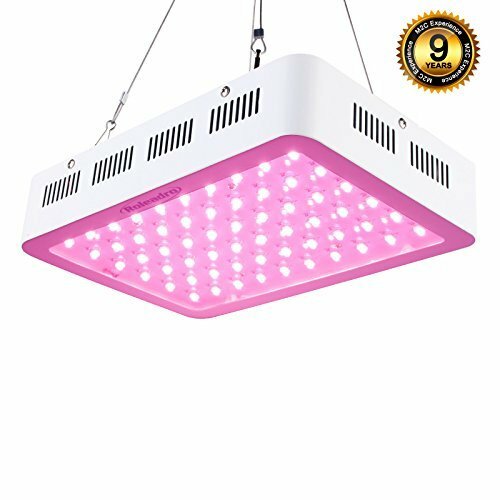 It is an attractive choice for you who need a grow light to facilitate the plant’s life cycle from the seedling stage to the flowering and maturity. At an angle of 60-degrees, the LEDs can easily penetrate the plant’s canopy to offer maximum penetration of the required wavelengths. This means your crops are set to respire and transpire at the best time. You’ll be able to see consistent growth with this LED. What’s more, it comes with its mechanism of cooling down so you can manage the height you place it without worrying about the heat. You’ll love that it is effortless to use starting with its subtle size. You’ll not be fussing around about how to go about the installation since it comes with the hanging kit. Along with the accessories is the power usage which even at 35watts it can easily replace a 100wattHPS/MH. Isn’t it energy efficient? You can now look forward to cheaper bills and a cool garden. The coverage area calls for a small grow space at a 1x1ft minimum and 2x2ft maximum. This will work well for your flower pots since you get to customize the intensity they get for the best flowering. When starting out in the flower business, this is the way to go since it does not need a high initial capital. The ACKE brand is not new to the LED Grow Lights industry. This particular model applies to every area of indoor planting from greenhouses, hydroponics, your basement and even your grow tent. The full spectrum covers light at the wavelengths which your crops need to accelerate growth, especially in the seedling stage. The spectrum range between the 420nm-750nm comes in handy to help your plant the right amount of sunshine to help it out through the leafing and flowering stage. Winter will no longer be a sleeping time for your orchids or wildflowers. The 40LED chips get you high brightness intensity at around 12W. This way, your plants can develop throughout the season. It is very efficient when it comes to energy consumption thanks to the die-cast aluminum sink. It provides for constant heat dissipation such that even when it’s close to the canopy, your crops will never burn. 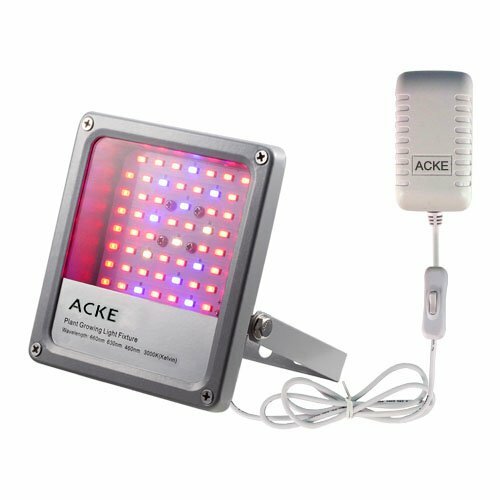 The ACKE is synonymous with the best durability you could ever find on a LED grow light. It’s not every day that you find them being waterproof. But this one meets the IP64 weatherproofing rate. This means you can water your plants without risking moisture seeping into the internal components of the panel. It longevity rates at 50,000hours and serves you in the best condition. Installation is a breeze with this model. First, the flexible bracket allows for a custom fitting. You can fix it directly over the plant while hanging on a bar; it can be screwed to the wall or placed on a flat platform. What’s more, the power output does not produce significant heat to have any impact on the plant. It’s even more pleasing to find that it uses a regular 110V power socket. This way, you’ll not be rewiring anything thus saving you on extra expenses. Can burn young plants if does not get them watered. The iPower is another great pick for those who need an LED Grow Light to hasten germination, provide strength to the growing crops and produce high yields. With a 3-band spectrum from 460-660, it is ideal to drive growth in the first staged of growth. You’ll love its 45W power output which does not heat up but is instead high enough to replace sodium and halide lamps. 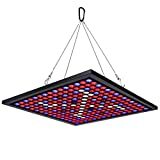 It comes with 225LEDs of mixed blue and red with the red taking the highest number at 165. This visible light in red is perfect for flowering and seeing to it that you have a high number of fruits. The blue is crucial in keeping the plant strong. This way, it can resist disease thus increasing growth and saving you on disease control charges. It gives the plant just the right dose of wavelength since it does not come with a wide variety where you may not always know which one is correct for which stage. This system rivals the 1000w HID since it can produce the same intensity but it uses 80% less energy. Of the light that it produces, 95% goes into the plant. This is unlike other lamps which lose much of it to heat. It reduces the need for constant watering and extra air conditioning making it a super-convenient ensemble. The sink carries an inbuilt cooling system which prevents heat from being radiated to the outside. This way, the heat cools off using its fan. This visible light in red is perfect for flowering and seeing to it that you have a high number of fruits. The blue is crucial in keeping the plant strong. With a lifespan rated 50,000 hours, you’ll love the time it serves you. It can go for years without asking for a replacement. The ABS plastic construction ensures it does not absorb any moisture such that if your grow space is too damp, you’ll not be reducing the life of the unit. It is rated to last up to twenty-five times more than regular incandescent bulbs. The iPower 2-pack 45W panel requires just plugging in, and you are set to start ripping the benefits. You’ll love that it does not need a lengthy installation process replete with tools and messy assembly. This tool works right out of the box. 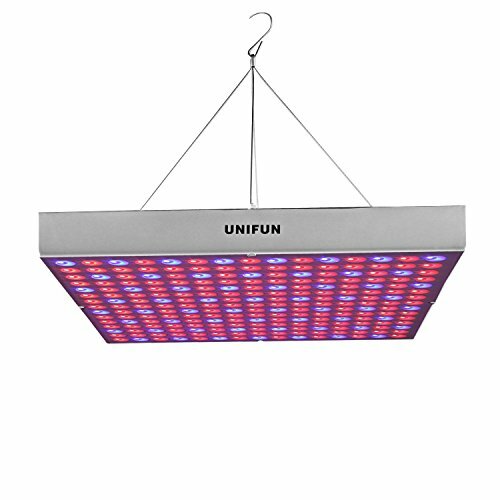 When UNIFUN means business, it must be their newest development in LED Grow Lights. This 45W system comes with four peak bands which are particular to producing the best plant environment. All types of plants; be it veg or flower can benefit significantly from this system. Its blue is in the 460-470nm which is ideal for green and healthy leaves since it induces the formation of chlorophyll and carotenoid. It also has visible infrared and UV when blooming and seeding respectively. The red light is not left out as it is essential for photosynthesis. You may notice that some of the colors may appear dim, but this is not to say they are not strong. It is always advisable that you have on some UV glasses since it simulates the sun. Nevertheless, as it produces the correct light for your plant, you’ll increase your harvest to 20%-50% more of what you’d normally get. We cannot forget the efficiency that this light brings along. It operates at a frequency of 50/60HZ which is the conventional supply in most American homes. It is also a compact unit which should not give you any trouble installing or transporting. The 45W power output produces the right wavelengths where the plant can absorb 90% percent of it. That’s why it is a popular model among flower gardeners. With a coverage area of 1.5squareft, you’ll be able to place it at the height of 12-18inches from the plant. The best thing about the panel is the operating temperature which does not threaten to burn your crops. You can run it comfortably for 16hours with a break of 8hours to provide the right alternation between respiration and photosynthesis. Looking at the design of the panel; the cooling sink has its very quiet cooling system to ensure that it runs without emitting any radiation. When at the right operating temperature, this unit is good to give you up to 50,000 hours of operative time. The shell can withstand high temperature without emitting any, that’s why you’ll be able to place it closer to the canopy. Better still, this grow light is free from any harmful substances including mercury and lead. Because of its low power needs, it needs no vents for cooling, therefore it is quiet. Besides the regular one-year warranty, it has an additional 30-day satisfaction period in which you can request your money back if you don’t like the product or if it doesn’t work. It brings 4 different bands to get the full spectrum to your plants. It has a low power consumption, which makes it perfect to harvest greens. It is an upgrade from a previous version from UNIFUN that has an improved design. For sowing in very large spaces, this may not be the best solution. It is good for greens but there are better products than this for blooming crops. 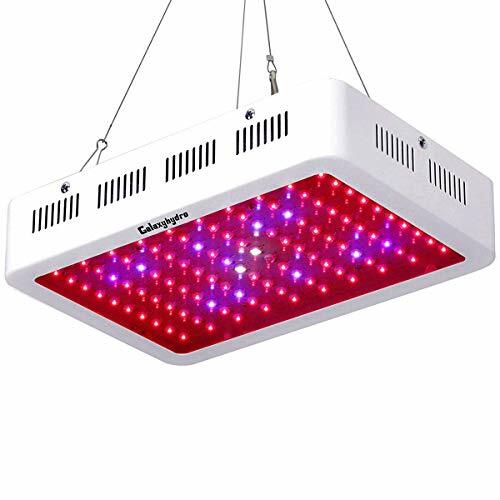 One of the best aspects of a LED Grow Light is for it to perform the job expected of it. With most designs falling short, we can’t say the same for the VIPARSPECTRA 600W model. Mainly because it meets every user’s demands, it is best for veg and flowers the same. You’ll be pleased by the power output, energy efficiency and the balance it brings between the spectrum and lumens. The beauty of this panel is that it covers the full spectrum of twelve bands. This way, you are not confined to the kind of plants you can grow. It covers all the stages thanks to the 380-780nm. The panel allows for switching between bloom/veg mode for a custom intensity output. You’ll see a better spread of the light as it will penetrate deeper and even better. This system uses a 5W chip which transmits to 120LEDs. The coverage is bigger than what you’d expect with a regular LED Grow Light panel. You can expect it to cover a 4x4ft area at maximum coverage. It angles at 90degrees which are well enough to produce deep penetration. It is perfect for all stages of development and especially in the flowering phase. You’ll also love it during the cloudy days as it helps you skip the worry about wilting and losing time in the development of bulbs. The VIPARSPECTRA uses a small fan for cooling. It comes with side vents which pull in fresh air to facilitate the cooling to the outside through the top. The outer bottom sheet never gets too hot to the touch which means you can place it as close to 24inches from the plant for deep penetration. This height suggestion is best for the flowering phase. If you are an intermediate gardener, this system comes highly recommended. When it comes to the power consumption, this panel uses around 276watts. It is much less than other traditional units seeing that it runs 70% cooler. It can last longer with a lifespan rating of 100,000 hours. The engineering sees to it that after plugging in the fans also begin working to provide the ideal temperatures for fresh functioning. It also runs quietly for those who grow weed near their living space. Maybe too bright for clones and young plants. Be sure to increase the distance from light to plants. King Plus equips you with the right equipment that facilitates indoor planting. 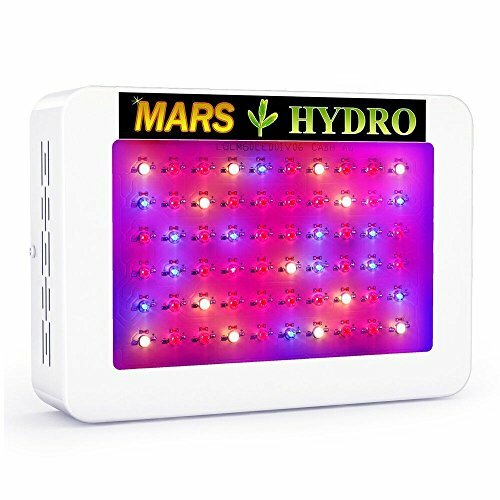 If you grow your cannabis at home, this is the LED Grow Light to watch. It provides the full spectrum of seven bands which benefit your plants to great lengths. You’ll like it for the manner in which it promotes photosynthesis and fast plant growth such that they grow taller and better. You should expect to see excellent changes within the first few weeks of using this unit. This model does not use the regular 3W or 5W chips. Instead, it boasts 10W double chips. To the surprise of many, it is very stable and does not give you a headache when it comes to cooling the system. Each LED carries two 5W chips to produce insanely bright light which burns stronger for longer. It achieves an even spread of light which reaches to every plant you have. You can expect the blooming stage to be exceptional with bright flowers and large bulbs. This goes to say your harvest will be on the rise once you start to use the King Plus. This unit gives you the full spectrum from 380-740nm. You’ll enjoy an even mix of all the essential wavelengths. It covers a good ration across the red, yellow, orange, and blue. It also has the UV which is good for maintaining a healthy plant. The IR bulbs also come in handy to promote cell division and increase the fruit output. Even at the full range it only consumes around 185w of power that is not what we can say for other models its class. The cooling mechanism is top-notch. The King Plus comes fully equipped with a glass board to provide constant convection with the fans. It also has holes on the side panels to support heat dissipation. This system boasts 90% less of heat emission and an overall of 15% over other designs. The dual cooling system also indicates that you’ll skip investing in expensive cooling device hence cutting your electricity bills. 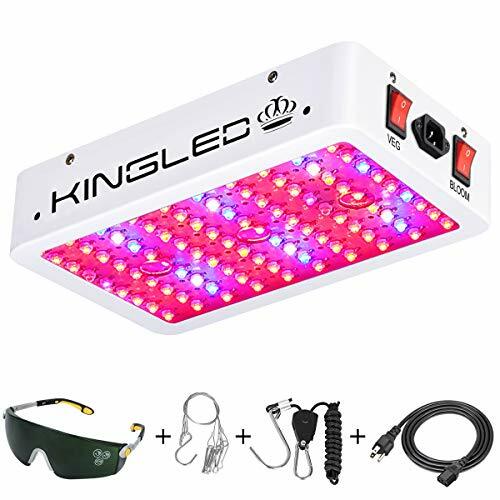 The King Plus LED Grow Light allows height adjustments to go with the growth phase of your weed. You’ll be able to vary the light when your plant is at the seedling stage or the maturity phase and still get the maximum coverage at 3.4ftx3.8ft. You’ll love every time you work with this system; it means excellent performance, superior quality, and long life. Roleadro is a reputable brand which uses high-end technology to produce the best LED Grow Light. This particular design has a power output of 300W when using a 5W LED chip. It covers the whole 380-780 spectrum in each chip to produce significant effects to all your plants in all their stages. This system provides the perfect environment for a wide variety of crops ranging from berries, legumes, weed, and many others. This system has a configuration of 60LEDs which produce the perfect balance between the lumens and the PAR. They are Zenor diode design which sees to it that the failure of one does not mean that the whole unit cannot perform. Instead, it continues to work with high efficiency. It can run for longer hours owing to the effective cooling system. This Roleador consumes 128W in a 50/60HZ frequency. It does not have challenges with the heat emission thanks to two decent fans which see that heat dissipates efficiently. It runs 70% cooler than conventional HPS/MH grow lights and it is in turn much quieter. You’ll love that the power supply is a separate entity in this unit such that you can maintain it safely. The coverage is very thoughtful for beginners and professionals the same. It can achieve a 3x3ft area at maximum and 2x2ft at a minimum all at 24inches. What’s more, there’s a clear guideline for those who are just starting. You can have the panel hanging at 36-40inches at the seedling stage, 18-25 at the veg, and 15-18 at the flowering stage. And remember, you don’t want to shorten its lifespan that’s why it’s important that it runs for a 16hours maximum at a time. A wide angle is seen with this unit. At 90-degrees, it can penetrate the canopy and ensure there’s an even light. This equipment is powerful enough to replace standard 250W HPS/MH and do better at energy consumption. It comes with the installation gear, so you’ll have a smooth time setting up in your grow space. Better still the aluminum shell protects the inner components. As such, it can take you through the 50,000 hours lifespan with no fuss. After this investigation it can be called one of best LED grow light. The 2nd gen 300w lights themselves are still pretty unreviewed and new. For those who appreciate the value in an inexpensive brand, the Galaxyhydro is for you. It features full spectrum of nine bands for all plant growth stages. This lamp covers more of red and blue to facilitate the seedling and flowering stage. Your plants benefit more with the UV and IR which also come in to provide high yields in cell division and also disinfecting the crop. You will see healthy plants with vibrant green leaves owing to the coverage you get from this lamp. It features 100pieces of 3W piled chips. 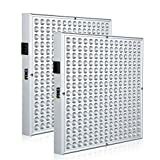 This ensures constant lighting which goes hand in hand with enabling deep wavelength penetration, high absorption rates, and overall luminous efficiency. What’s more, it consumes 135 watts enough to rival any 250W/400W HPS/MH. It is thus the best choice for indoor hydroponics. You are safe from making deep-pocketed investments on the cooling system since it produces a lower percentage of heat. It comes with two fans to ensure that it can run for up to 20hours without causing any safety hazard. It has an extended period as compared to other 300W LEDs. Not to mention; the hanging height is as close as 24inches for the flowering stage. It is also useful in the other stages hence you’ll not be purchasing another type of light. This lamp offers 90degrees and 120degrees angling so that the light can reach every plant. This means that no matter the type of crop growing in your space even growth is achievable. What’s more, it is resistant to heat emission such that it is possible to place it directly a few inches on the crops without triggering a burn on the leaves. It is the perfect deal for those who live in cold areas or when seasons are long. It can be irritating when your indoor gardening is replete with noise. That’s why this model emits significantly low sound levels. It produces around 55decibels which you’ll barely notice. Along with the silent system is a decent coverage which can go as far as 3x5ft. All in all, this light is quite reliable considering that the price is very attractive. 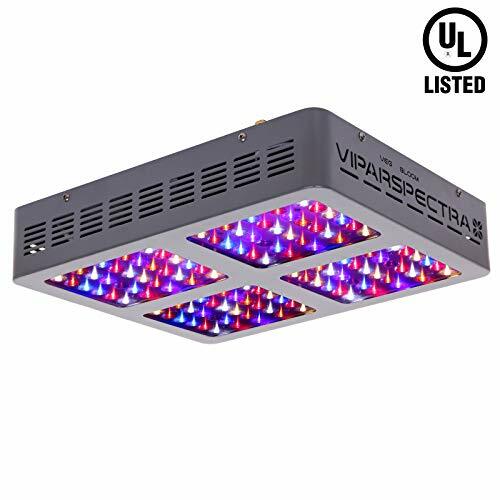 Do you need a finely tuned LED spectrum for your indoor gardening needs? Well, the Marshydro Mars brand has it all. It is not one of those that describe full spectrum on the label only to cover a few ranges. With this one, you get everything you ask for. 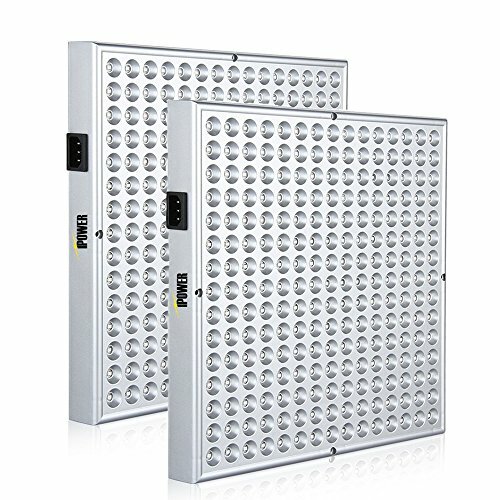 With an output f 300W, it is equipped with 60 pieces of 5W Epistar LEDs. It is efficient in light penetration, absorption, and luminous performance. This lamp leans more towards the red light which produces a purple tint. It is synonymous with what many horticulturalists call plant’s favorite. It has all the relevant ranges from 650-660nm, 620-630nm, 450-475nm, and 430-440nm. It is suitable for all stages to produce faster and healthier growth with much higher needs. Any intermediate gardener will find it useful to cater for their crop from germination up to the flowering phase. This system boasts 60% cooler running than in HIDs. It can manage the cooling off all by itself using powerful fans which run at a negligible noise. You’ll be able to go on with your work and even maintain a sane conversation when this unit is operating. The mass-cushion sinks provide for high air intake which in turn provides a cooler grow tent. You’ll see a lower water intake since the transpiration is controlled. This unit provides either 90 or 120degrees LED view. The coverage is to a point where it can emit light over 2×1.5ft for the flowering stage and 2.5x2ft for the veg phase. You are in control of the light intensity which can produce the best conditions for maximum plant growth. When it comes to continuous lighting, each diode is protected such that when one burns out, it does not produce a successive effect on the others. This increases the lifespan of the unit so that it can last longer than other lamps. This light uses just 134watts of power which can easily replace a 150W HID/HPS. The installation is a simple plugin, and it works right away. You don’t have to assemble any parts. Even better, it has the allowance of installing a digital timer to control the spectrum. It comes with copper metal buckles for durability. It can resist rust and corrosion which comes with being in damp places. And because it does not heat up, you can put it as low as 12inches or as high as 30inches. To say the least, this is the best all-around LED Grow Light for the money. LED grow lights simply mean artificial lighting systems which are tailored to facilitate indoor horticulture. They discharge light which promotes growth throughout the life of the plant while keeping the plants strong, healthy and producing high yields in return. What Is The Difference Between LEDs And HIDs? HID (High-Intensity Discharge) lighting uses electrodes which have a capsule of gas while LED (Light Emitting Diode) use a diode which emits light after being connected to a circuit. With technology advancements, you’ll notice that even though both grow lights share the same performance LEDs use far less energy than HIDs. Setting up an LED grow light is fast and easy since it does not require the installation of cooling systems and ballasts. HIDs tend to get hot hence they need a means of external cooling. More so, LEDs have targeted light which does not get lost to heat. This makes them more efficient than HIDs in the long run. Their LEDs have a longer lifespan than HIDs. They can have covered up to 100,000 hours which is not what you can say for HIDs since they can only go for 20,000 hours. 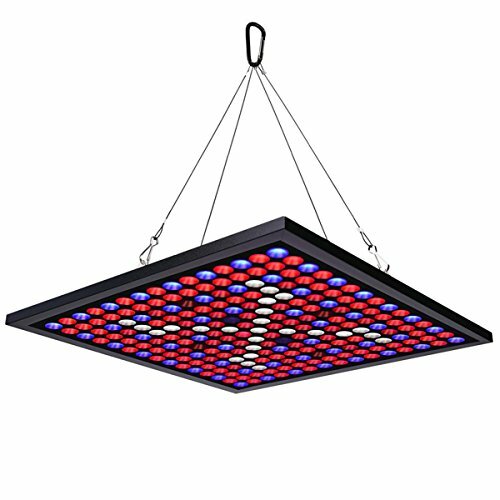 At What Height Should You Hang The Grow Light? Every brand comes with the recommendations, but there are a few factors to consider. First, what is the stage of growth for your crop? Plants in their seedling stage do not need too much light; hence you can place it a bit higher around 30inches. For the vegetative stage, a medium height will do to promote the growth of vibrant leaves. Crops in their flowering stage use the highest amount of light. At this phase, you can place it as low as 12inches above the plant. You have to, however, watch out for the heat that your light emits before placing it too close. At this point, you need to look at the lens that your light uses. A LED lamp which focuses light directly can burn the crop. What Are The Benefits Of Switching To LED Grow Lights? This type of lights produces more output for both the vegetative and flowering stages. LEDs yield more harvests than HIDs, and other grow lights with up to 50% high. As the world becomes more aware of global warming, LEDs make for a cleaner form of lighting. LEDs optimize greenhouse conditions in a more sophisticated manner than high-pressure sodium installments. Targeted wavelengths- among the best advantages of LEDs are their effective control of the factors for plant growth. Since plants are sensitive to certain wavelengths, LEDs come with the ideal wavelengths for chlorophyll absorption. You can optimize the wavelengths between 400-700nm. This means your plants can get the right light and produce efficiently. Energy Savings- LEDs produce an eco-friendly solution to indoor gardening. They have low power consumptions hence you are saved from high electricity bills. Emit Low Amounts of Heat- the biggest challenge facing traditional grow lights is that they heat up and call for cooling systems. The best thing about LEDs is that they have inbuilt cooling fans to dissipate heat. What’s more, their light is directly absorbed by the plants, so it does not get back into the unit as heat. Hopefully, you’ll have an easy time picking your next LED Grow Light. Our brands have surpassed our expectations, and we know you’ll find them sufficient for all your indoor gardening needs.